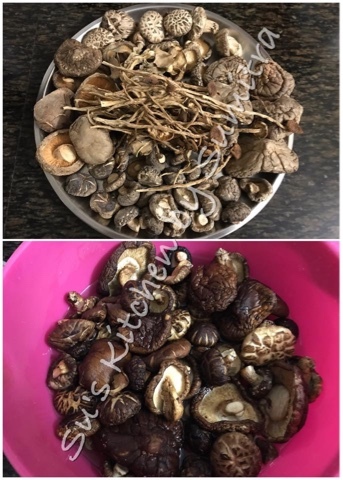 It's a traditional dish of Jharkhand. It's made during festivals and can be had for breakfast and snacks. It's a fried savoury pancake. Easy to make with few ingredients. Rice and lentils are soaked in water and made into a smooth batter with garlic and ginger. Cumin seeds, chopped chillies, green peas, coriander leaves, salt and turmeric powder are added to the batter and it is deep fried. It's serve with ghugni or aloo rassa. Wash and soak the rice and the lentils separately for 6 hours or overnight. Grind the rice and the lentils along with the garlic and ginger in a grinder into a smooth batter. The batter should be of dropping consistency. Add the salt, turmeric powder, cumin seeds, peas, chopped chillies and coriander leaves. Mix the batter, let is stand for 10 minutes. Heat oil in a wok, add a ladle of batter and fry it till golden brown on both the sides. 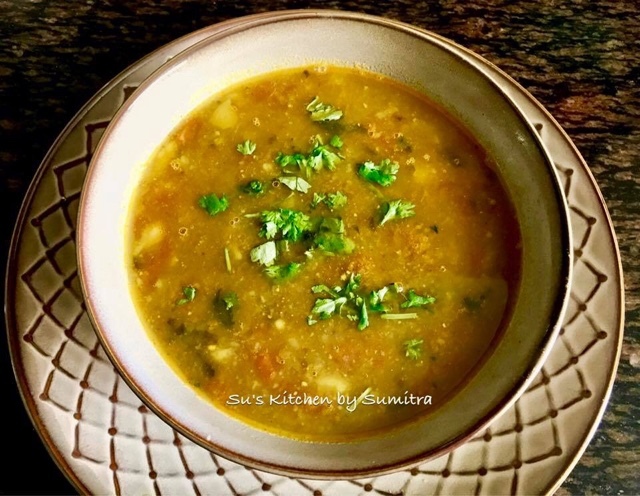 Serve it hot with Aloo Rassa.. 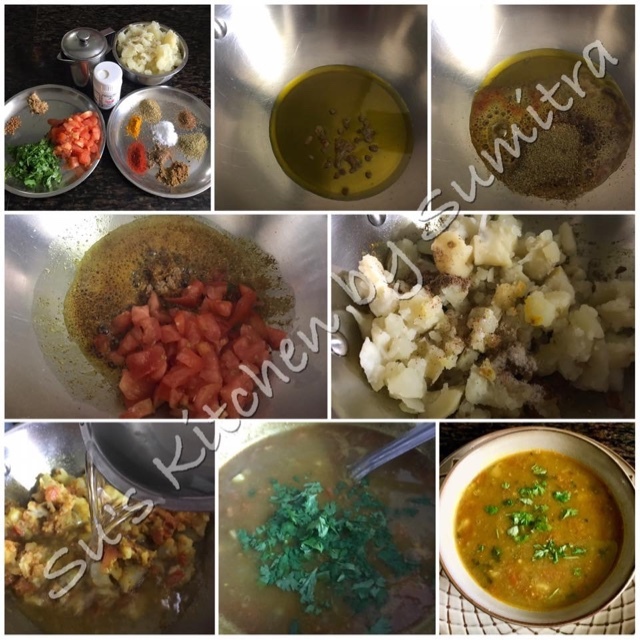 This is a Potato Curry recipe. This dish can be eaten with chapatis, rotis, parathas or pooris. It can be had during breakfast or main course. Take a wok, add oil. Add the fenugreek seeds, sauté for few seconds. Add coriander powder, cumin powder, fennel powder, red chili powder, turmeric powder and asafoetida. On a low flame stir for few seconds. Add the ginger paste and tomatoes. Sauté it till the tomatoes become mushy. Add the potatoes, salt, garam masala powder and dried mango powder. Stir and add a cup of water. Stir and and let the curry simmer for 10 minutes. Once the curry thickens add Coriander leaves. 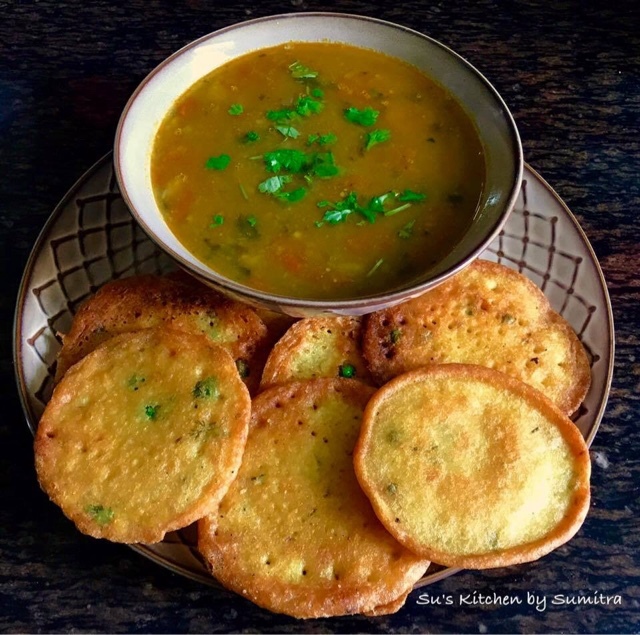 Serve it hot with pooris or paratha. It means bread of the royal palace. It's a Lebanese dish. 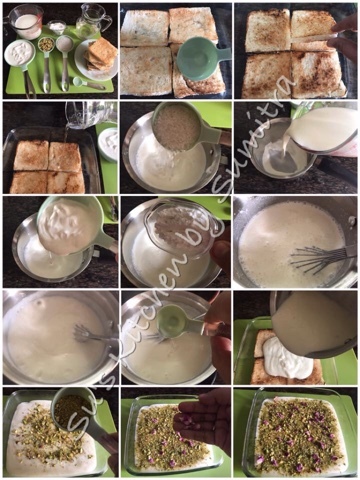 Aish El-Saraya is made on special occasions. Sweet sugar syrup is drizzled over the toasted bread and covered with thick cream on top. 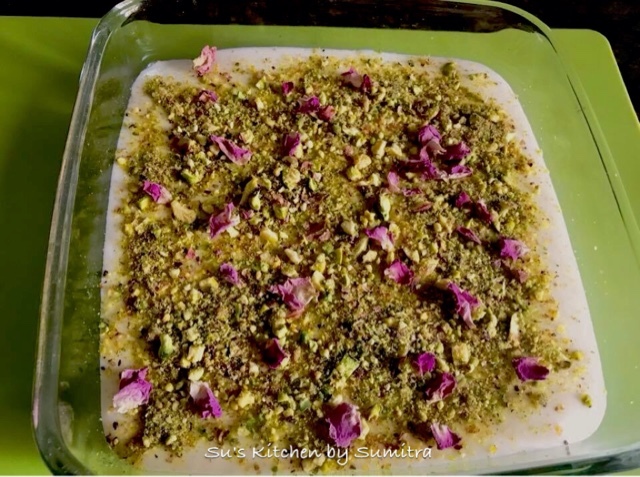 It is garnished with chopped pistachios and rose petals. It is served chilled. Add sugar, lime juice and 1/2 cup water in a saucepan. Stir and let it cook on low heat until the sugar dissolves. Increase the heat and bring it to a boil and switch of the flame. Stir in rosewater. Cool for 10 minutes. Take a baking dish. Place 4 slices of toasted bread slices into the dish in a way that no gap should remain. Pour 1/2 of the syrup on the bread. Top with remaining bread. Drizzle with remaining syrup. Keep it aside. Add milk, cream, sugar and cornflour in a sauce pan. Stir it till the cornflour has mixed well. Cook, stirring it constantly, until mixture boils and thickens. Switch of the flame. Stir in rosewater.Pour over the bread in the dish. 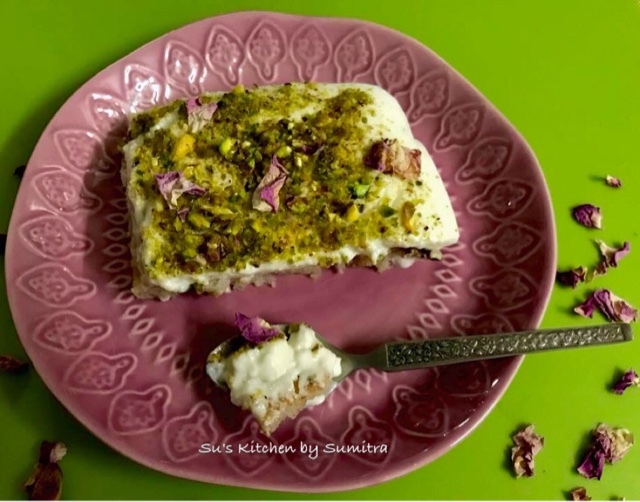 Sprinkle with pistachio. Set aside to cool. Refrigerate until it sets. Serve. 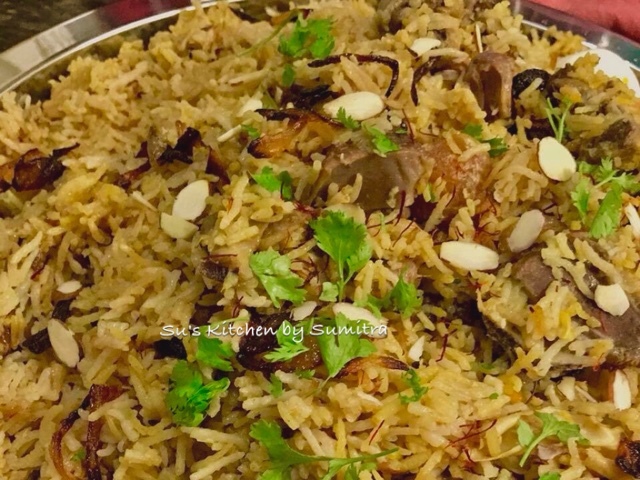 Pilaf or Pulao is a dish in which rice is cooked in a seasoned broth. Sautéed onion, spices, vegetables, fish, meat and dry fruits are added depending upon the local cuisine. It is a common dish made in India, Bangladesh, Middle East and many other countries. This is an easy recipe. The dish has a mild flavor and taste of the spices and saffron. 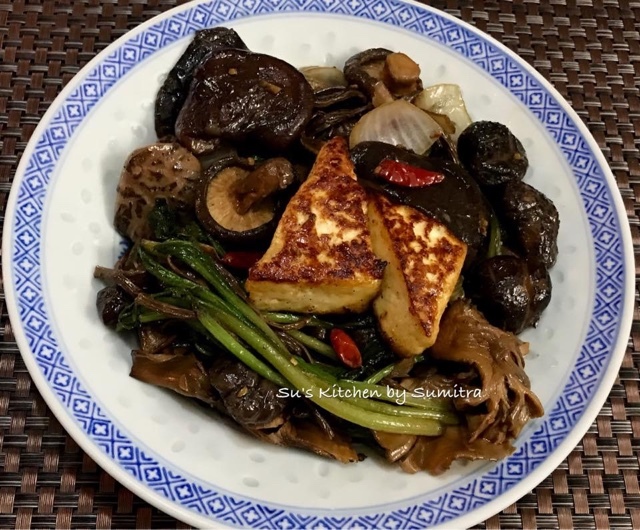 This dish can be made in various ways. This dish can be served with raita. Wash and soak the rice and keep it aside. Soak the Saffron and turmeric powder in hot milk, keep it aside. Take a big pot, add a tbsp of ghee and let it melt. Add the green cardomom, cinnamon stick, cloves and fennel seeds. Let it splatter. Add 1/2 the quality of the sliced onions, saute till pink in colour. Add the mutton pieces, salt, sugar and bay leaves, stir and cook for 10 minutes. 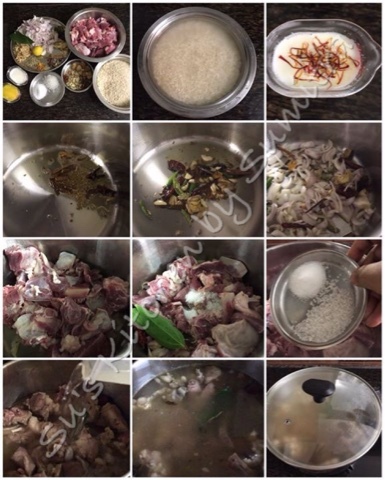 Add 2 liters of water, stir, cover and cook till the mutton has become tender. Remove the excess mutton broth if any and keep it aside and can be enjoyed as soup, as when we add the rice, it will cook in the broth, so the broth should be just enough to cook the rice. To be precise, there should be 4 1/2 cups of the broth. Take a wok, add the remaining ghee, let it melt. Add the remaining onion slices, fry the onions till golden brown in colour. Remove a tbsp of onion and keep it aside for garnishing. Add the 1 tsp almond flakes and raisins into the remaining fried onion slices. Stir for another minute. Add the ginger - garlic paste. Sauté for a minute. Add the fried onions, apricot, lime juice and nutmeg powder into the mutton broth. Adjust the salt. Drain the excess water from soaked rice. Add the rice, stir and let it cooked till 80 percent of the rice is cooked. Add the saffron milk. Stir the rice gently. Cover and cook till done. 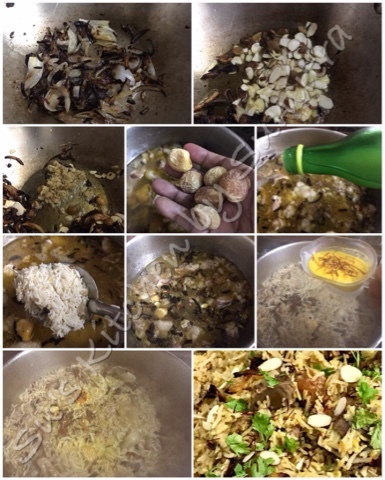 Before serving garnish with fried onions, pinch of saffron, 1 tsp almond flakes and coriander leaves. 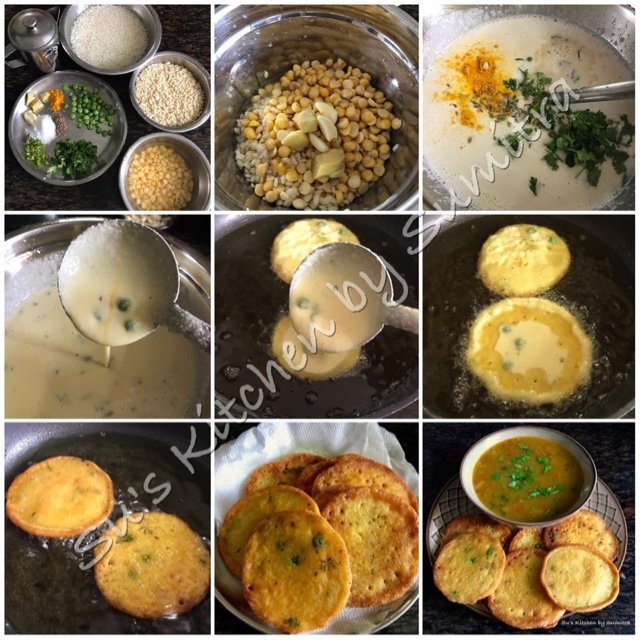 Serve it hot with raita. Take a wok, add oil. Then fry the cottage cheese / tofu until brown on both sides. Keep it aside. In the same Oil sauté the garlic, ginger and chillies for a few seconds. Add the onions and saute till translucent. Add the spinach and sauté on high heat for a minute. 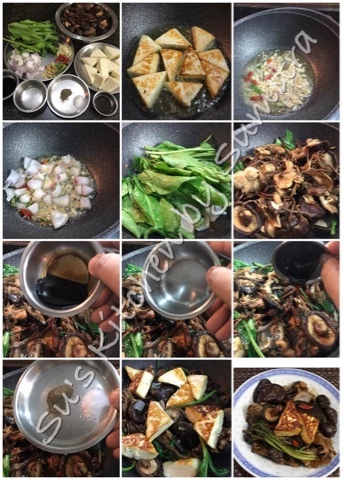 Add the mushrooms, add the soya sauce,vinegar,honey, salt and pepper powder. Add the cottage cheese / tofu. Stir it. Cover let it simmer in it's juices for 2 minutes. Serve it hot. This Pickle has no oil at all. It only consist of raw mango, spices and water. 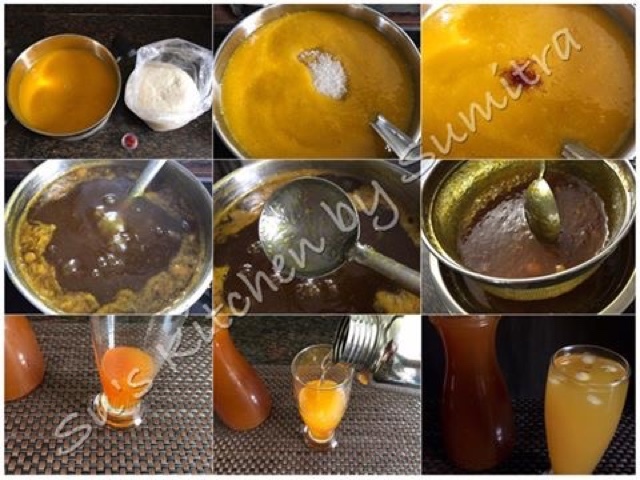 With just few techniques to follow, this pickle is ready and it stays for 2 to 3 months. To preserve it further, you can refrigerate it. 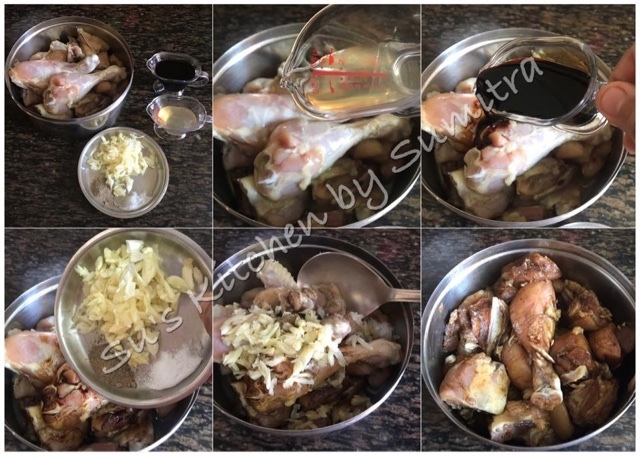 Roast all the above ingredients except turmeric powder and asafoetida powder for 2 minutes. 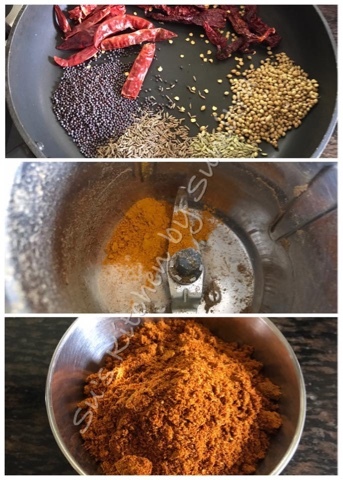 Cool it, add the roasted spices, turmeric powder and asafetida powder into a grinder and grind the spices into a fine powder. Keep it aside. 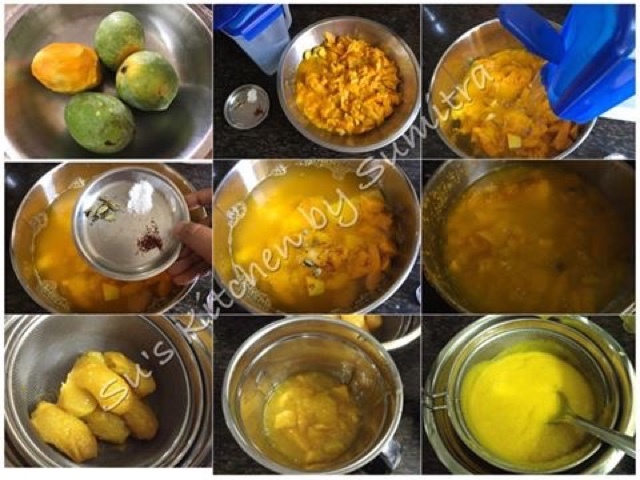 Apply the turmeric powder and salt to the mango pieces. 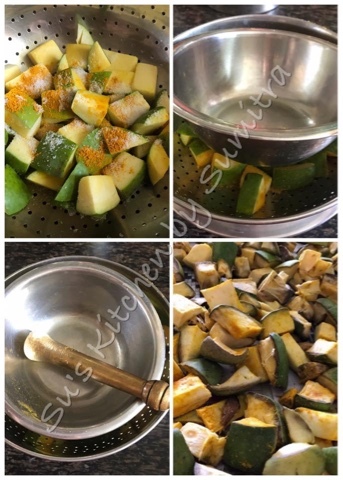 Keep the mango pieces in a steel strainer, place another smaller vessel on the mango pieces, and put some heavy weight on the vessel. Keep it aside for 6 to 8 hours. Some of the water from the mango will drain out. Take the mango pieces and spread it on the paper or cloth and let it dry for another 8 hours. Take a pot, add water and salt into the pot. Let it boil for 5 minutes. Switch of the flame and let the water cool down completely. Take the water in a bowl, add the spice powder and mix it. Add the mangoes and mix it. The water level has to cover up the mango pieces. Transfer the mangoes into a clean dry glass bottle. 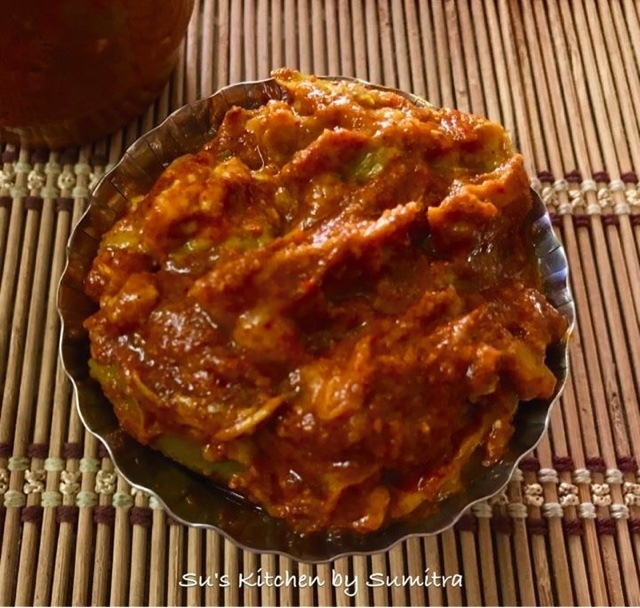 The pickle should fill up to 3/4 of the bottle, as the water can leak from the bottle while the mango pickle process is still on and it takes 7 days to be ready. 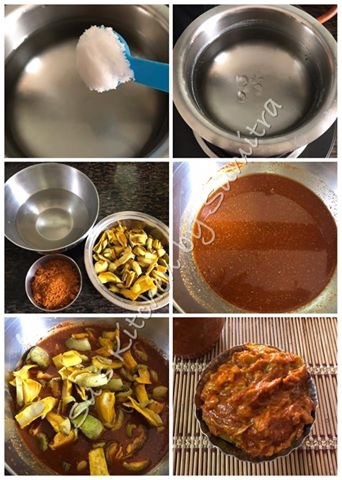 Initially the spice water is liquidy, but eventually the mangoes and the spices will soak up some water and it will become into a thick paste. You can enjoy the pickle after 7 days. 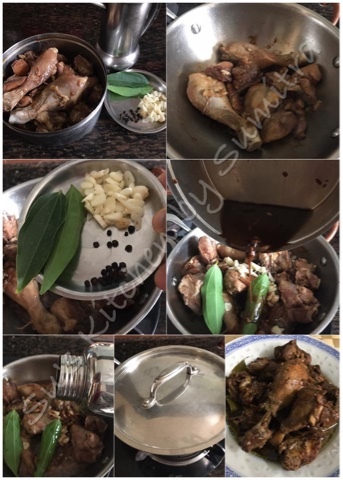 Adobo is a popular dish and it is unofficially considered as the national dish of Philippines.When the Spanish invaded and settled in the Philippines during the 16th century, they discovered this traditional Filipino cooking method and called it adobo, which is the Spanish word for marinade. There are many regional variations of adobo, but most recipes includes vinegar, soy sauce, garlic, bay leaves, and black pepper. Coconut vinegar, rice vinegar, or cane vinegar is used. 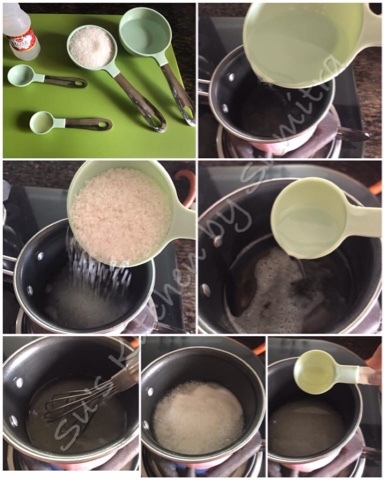 At times even white vinegar can be used. Adobo can be made with meat, fish or vegetables. It is most commonly made with chicken and pork or both combined. It is served with white rice. It was traditionally cooked in small clay pots. This time while my stay in Singapore, I was invited by a Filipino friend for dinner. 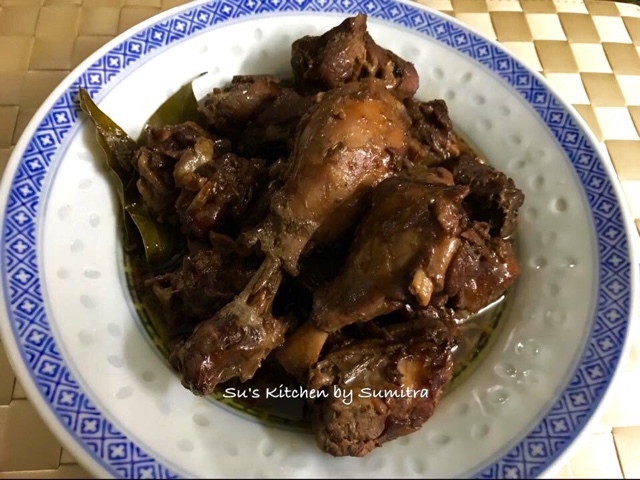 She has made few traditional dishes, one of them was Chicken Adobo. I fell in love with this dish and can have a plate full of rice with it. It's very simple to make. It is tangy and salty in taste. It's a must make dish. Add all the above ingredients into a bowl and mix it well. Cover and marinate it for at least 3 hours to overnight. Take a wok, add oil. Let the oil heat. Add the chicken pieces and fry it until brown on both the sides. Pour in the marinated juices, garlic, bay leaves and pepper corns. Add a cup of water. Cover and cook till the chicken has become tender. Serve it with hot steaming rice. Since I am very fond of making various types of pickles, my husband got around 3 1/2 kgs of Raw Mangoes from a tree situated in the compound where he works. Apparently I had made 2 kgs mango Pickle the same day. So I kept the raw mangoes for 2 days, and by the time when I thought about making some more mango pickle, these mangoes were already in their half riped stage. So thought of making Mango squash. This is an experiment in my kitchen. This Mango Squash has no preservatives and will stay for 3 months in the fridge. I loved the flavor of the saffron infused with the flavor of the Mangoes. It is sweet and sour in taste. Peel the skin of the mangoes. Cut them into pieces. Take a big pot. Add the mango pieces and the mango seeds along with the flesh into the pot. Add water, cardamom crushed, saffron and salt. Let it simmer till the mangoes have become pulpy. Let it cool. Remove the mango seeds and squeeze out the pulp from it and discard the seeds. Add the rest of the mango pieces and the pulp into a blender and blend it. Take a wire mesh strainer and strain the juice out. Take a pot, add all the above ingredients. Let it simmer till it reaches a level before the one string consistency and small lumps begins to form. To check, take the juice on a ladle. Pour out the juice from the ladle. You will see small tiny lumps stuck on the ladle and the juice has thicken a bit. Switch of the gas. Let it cool. Strain the juice out through a wire mesh strainer. Let it cool completely. Store in dry glass bottles. 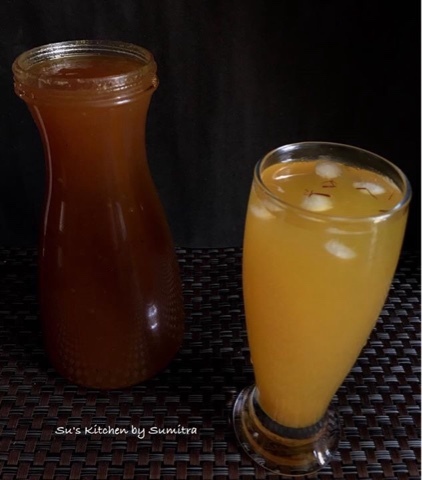 To make the Sharbat, fill up 1/4 of the glass with the Squash. Add chilled water and ice. Stir it and enjoy it.